Yes, through a lot of tedious long hours of programming, getting the necessary parts, testing and retesting the system paid off in what most people that visit my man cave call my crowning achievement. At my finger tips lay a vast list of classic arcade and console games from the golden age of video gaming, from the Arcade, to the 2600, all the way up to the Super NES. It is truly a marvelous sight and one of the best investments in terms of replay value I could have ever added. So that’s today’s topic, the top 10 essential arcade games that I feel any Cabinet should have as a rule. Speaking of rules as always I did set myself some in compiling this list to keep myself honest and on target. 1) The game has to be one that truly is played a lot on my current machine. I consider my group of friends and family to be a pretty good slice of the population. Therefore, any game that’s currently being played a lot on my arcade machine is therefore popular enough to make the cut. This rule actually eliminated a lot of all time classics such as Q-bert, Dig Dug, and Gauntlet because honestly they aren’t really played much. 2) Only one game from each series. That would be any game out there that had an original and then some sort of sequel. So even if I wanted to include both Pac-Man and Ms. Pac-Man or Donkey Kong and Donkey Kong Jr. I could not. I have to limit myself to only one of those games to be fair. 3) This is just arcade games. Most prefab Arcade cabinets only give you the choice of arcade games anyways. So although my cabinet as an NES, an Intellivision, etc. I’m going with the premise that these other classic systems wouldn’t be options. For anyone in the past 10 years that has been drinking at a bar on a random Weds. 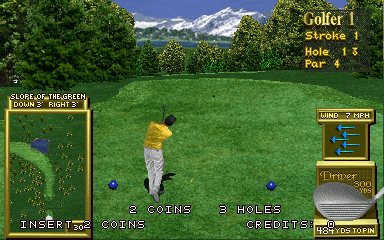 night, chances are soon or later you and your buddies got around to playing a game of this classic Golf simulator. A lot of swearing probably took place as well as some yelling and overall high fiveing as with the limited hand/eye coordination you had using a trackball to guide a pretend golf ball into a computerized hole from 400 yards out was quite the memorable experience. And it didn’t matter if you were a nerd, a jock, a chick, some nerd/jock/chick hybrid, whatever everyone seemed to enjoy playing this game for a couple holes and laughing when some poor shlubs ball landed in the drink. Even now with my own cabinet, this game is usually busted out when people are drinking and causing a ruckus. And still has the same effect on people as it did in the bar. All players from all walks of life start joining in and having a good time. It’s a essential “social lubricate” game and that’s why it makes the top 10. 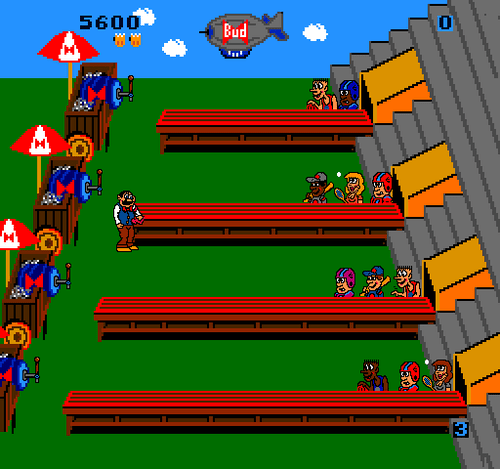 I gotta say that I didn’t play much of this game until I did get my arcade cabinet, and despite not exactly having the proper controls for it (ie a large keg tap..as y’know that’s actually being used in my man cave for it’s real purpose…pouring suds), it’s now a game I don’t think my buddies and I could live without. Most of the really good games on this list are what we call “High Score Only” games, meaning you get one coin and a set number of lives with no continues and you have to set the high score. These are the best games in my option because they take a lot skill and once someone sets a high score, there’s not only a lot of pride for that player, but it naturally gins up competition among the rest of the group. For a bar man cave, the Budweiser version of Tapper is the one we play here, but you could play Root Beer Tapper and have just as much fun. It’s a fast paced, quick thinking game that requires a lot of attention and instantaneous decision making. Plus its got a great cast of colorful characters, funny and enjoyment sprites, and solid replay value. The first of the real heavy hitters on our Arcade game list, I don’t have to tell you how important this game is nor why it’s really included. It’s probably on most peoples short lists of all time greatest Arcade games out there, and was really the killer app that put gaming giant Konami on the map (filling up their coffers so they could turn around and put out equally important console games like Contra and Castlevania). And it’s pop culture value can not be denied either. 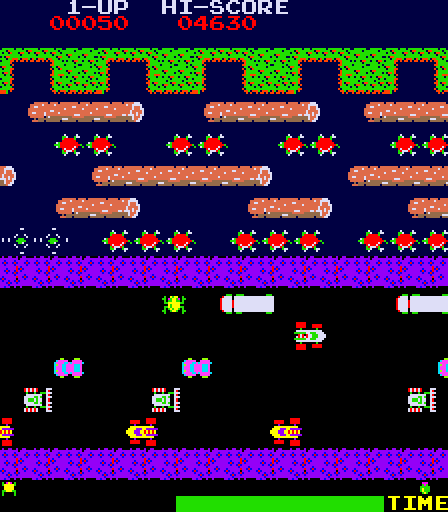 First it was a part of the classic 80s cartoon Saturday Supercade, abeit in this werid form where Frogger was a investigative reporter and got abducted by aliens frequently. But more importantly, as the basis for an all time classic episode of Seinfeld, in which George purchases a Frogger game from his local pizza parlor just to keep the record of his high score set during a pizza and Mountain Dew fueled binger in his high school days. It requires the help of Slippery Pete, one hell of a rogue electrician, who as Kramer says “is the best…and the worst” and has that classic last scene in moving the Frogger machine across the busy street. Overall, the entire episode is a wonderful homage to the power that is the high score and encapsulates the fierceness that some will cling to it. Any self respecting Arcade essentials list must contain at least 1 fighting game. Second only to High Score, the skill and pride wrapped up in taking on any challenger to stay on an fighting arcade machine is intense to say the least. Watching your opponent sink quarter after quarter into the machine while you proceed to beat his brains out with your mad button mashing skills is a Nirvana unto itself, and I would be a fool not to have at least one entry of this game genre make the essential 10. When it comes right down to it, there are 2 looming giants in this field: the Street Fighter series and the Mortal Kombat series. Both equally important, both equally influential, both with rabid followers ready to go down swinging to prove their game is the better camp to belong to. I for one can appreciate both and at times in my youth played massive amounts of both series. But given my rules above, I really had to only pick one. And the decision came down to which game was played more in my man cave basement currently. 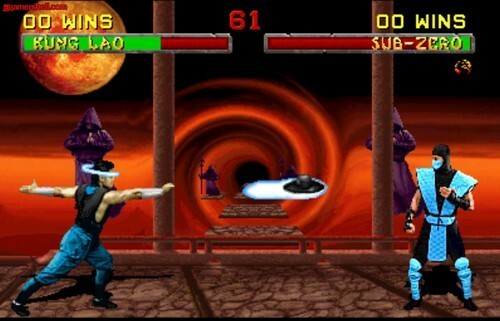 The answer was without a doubt: Mortal Kombat II. Like the fighting game, another historically important arcade genre is the “Co op Beat’um up”. Whether that’s two players like Double Dragon, or the more inclusive 4 player co op, these games are really the apex of buddy gaming, and are just as important as high score gaming/fighting because there are sometimes when we want to put aside our competitive spirits and join forces for the common good. In fact, so many of my really great memories of growing up with arcade games was wrapped up with co op beat’um ups, mostly with my cousin, JA. As I said above, even back then I was always more interested in playing with friends than against friends and nothing got my blood going more than a solid team up. There were a ton of game I could include on this list as the token entry from this genre, but in the end I picked Captain America and the Avengers. Some out there might cry foul and say it’s the TMNT series, to which I would say, those games were designed to eat nothing but quarters and so were built to unfairly stack the deck in the games favor. Others would point to the above mentioned Double Dragon, Golden Axe, or Final Fight games, but they aren’t as inclusive with only 2 or 3 player Co-op options instead of 4. Still others would say the Dungeons & Dragon co-ops and although I can’t argue that those games are some of the best examples of the genre with solid game play and intuitive leveling of characters so you get better over time, they are late entries into the genre and as a result aren’t really well known. So it came down to one of the 2 classic Marvel comics themed games from the early 90s: The Avengers or the X-men. I picked the Avengers because as I said in other blogs, I’ve always been an Avengers guy more than a fan of the mutants. 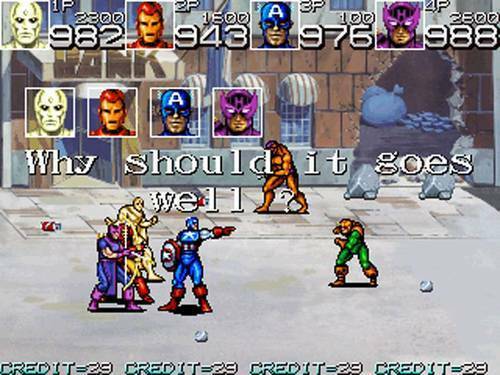 But more importantly, although the X-men game is more pretty to look at sometimes, the game play is again geared more to eat quarters that the Avengers game, as in order to use mutant powers, you have to sacrifice life, where as in the Avengers game if you want to throw Captain America’s shield, you just do it. I mean, this game has the added benefit of not just being a great co op fighting game but really being something that all the players can laugh over for a second in between beating the every living tar out of the Whirlwind.